Like Apple's Smart Cover, Luvvitt's Backlit Ultrathin Keyboard Cover has a magnetic spine that latches to the side of the mini and is strong enough to support the full weight of the tablet, even as it swings in mid-air. When it's time to get typing, the iPad mini can rest, at a fixed angle, in either landscape or portrait mode in a slot above the keyboard. Design-wise, the Luvvitt is very similar to the Logitech Ultrathin Keyboard mini, but the latter's aluminum back has a premium look that more closely resembles the iPad mini. The deck of the Luvvitt has more indicator lights (Caps Lock, Bluetooth, Charge and Power) than the Logitech, but their placement makes them less than useful. When an iPad mini is docked in the Luvvitt's slot, the lights are obscured. 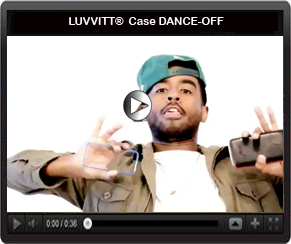 The Luvvitt case and the iPad mini together have a minute, 0.4-inch profile. Not to split hairs, but the Logitech Ultrathin Keyboard mini is a slightly thinner 0.3 inches. The Luvvitt cover is also slightly heavier than its Logitech competitor, at 8.1 ounces versus 7.7 ounces. From the number row on the Luvvitt keyboard, you can adjust brightness, launch a slideshow, search, open the browser and access media controls, but you must use the Function key to engage each option. Two keyboard cases we've tested that have a dedicated row for media and tablet controls include the ZaggKeys Mini and the Kensington KeyFolio Pro 2. Near the space bar is a dedicated button for launching the keyboard's blue backlight, which was strong enough to help us make out the labels of the keys in a dark room. We scored an average of 53 words per minute with 97 percent accuracy on the Tap Typing app using the Luvvitt Backlit Keyboard Cover. That's good, but not has high as our score on the Logitech keyboard, on which we averaged 61 wpm with 98-percent accuracy. We also had a slightly easier time with the ZaggKeys Mini 7 (56 wpm, 98 percent) and the Belkin Portable Keyboard Case (54 wpm, 97 percent). Our most frequent typing mistake on the Luvvitt's island-style occurred when we aimed for the Delete button but instead hit the =/+ key just above it. The Enter and Space Bar keys are also small. With practice, however, we cut down on errors. While Luvvitt's island-style keys felt good beneath our fingers, they were slightly mushier than those on the Logitech keyboard. 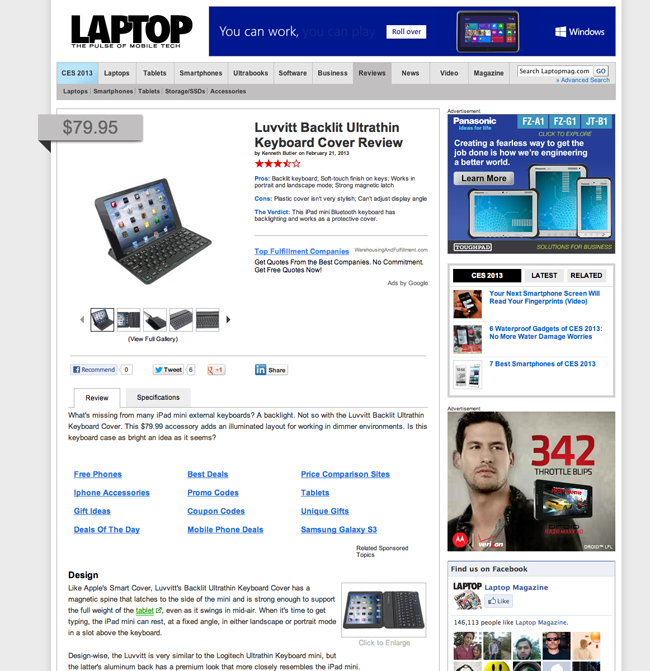 For $79, the Luvvitt Backlit Ultrathin Keyboard Cover provides a solid typing experience and a backlit keyboard in a slim design. For the same price, we prefer the Logitech Ultrathin Keyboard mini, which has a more elegant look and provides a better typing experience. But for those who do a lot of text entry in low light, the Luvvitt is a dependable option.